Location is an important context that web services can utilize for fun or smarter user interaction. In past getting location used to be difficult, but now thanks to good IP locationing databases and browser geolocation capabilities it is becoming a lot easier. // Will print "You're in 60.1633, 24.9279"
The examples above will work with both anonymous site visitors (using sessions) and registered users (using Midgard's position log). 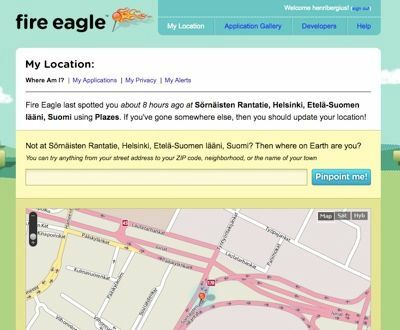 In this example we check if location is already available via browser geolocation or some importer like Qaiku or Fire Eagle, and if not we fall back to IP-based positioning using the GeoPlugin service. The resulting user location array or object (depending on Midgard used) contains a textual description of the place and accuracy information in addition to WGS-84 coordinates.